Singaporean chef/cooking teacher Vanessa Frida speaks warmly of Thai sweet chili sauce and its all-around usefulness. M. de Joie had heard of it but wasn't really sure what it was -- there are many products labeled chili sauce or chili paste that don't taste at all like what a Californian might think. But Vanessa Frida knows whereof she speaks. 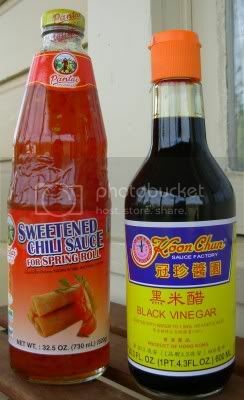 So the next time M. de Joie stopped in at Lao Market (2660 South Market Street, near Racha Noodle) to pick up some sesame oil and nuoc mam, she grabbed a bottle of Thai sweet chili sauce and took it home ... where it sat for several months. Finally she opened it up to make a Thai-style cucumber salad, and discovered how incredibly delicious it is served on - well, just about anything. It's gooey, sweet, and spicy-hot, and makes a wonderful dip/spread to use with wild abandon. What's it good on? Fried chicken, shrimp, raw vegetables, grilled cheese, onion rings, pork chops, French fries, toasted sesame bagels, grilled hot dogs, steamed rice, cabbage salad, a pastrami or corned beef sandwich, lamb kebabs, cream cheese on a cracker, a hot buttered English muffin, and probably a lot of other things yet to be discovered. Another item to pick up in an Asian market is black rice vinegar. White rice vinegar is more familiar but there are also red and black varieties. The red is a bit salty; black vinegar is more assertive than the white and somewhat resembles balsamic vinegar. If you love experimenting with Asian foods, this should be on your shelf. Try mixing equal parts good-quality soy sauce and black vinegar and adding a bit of grated ginger and/or sesame oil to make a dipping sauce for pork roast, eggrolls, spring rolls, spareribs, pot stickers and dumplings, or as a dressing for a cucumber or cabbage salad. Then there's Trader Joe's Wasabi Mayonnaise. M. de Joie found it above the frozen fish in Trader Joe's and hasn't given a single thought to ordinary tartar sauce since. 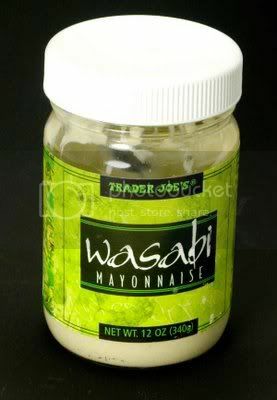 It has a nice wasabi kick and goes great on fried fish, shrimp, and oysters, roast beef, or as a sandwich spread. Also try dipping crackers or crudités into wasabi mayo, then into the sweet chili sauce for an extra blast of heat and flavor. Sweet chili sauce, about $3.20 for a 32.5-ounce bottle at Asian markets. Black rice vinegar, about $2.39 for a 20.3-ounce bottle at Asian markets. Trader Joe's Wasabi Mayonnaise, $3.29 for a 12-ounce bottle at Trader Joe's.